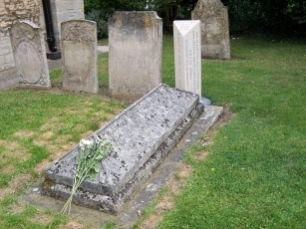 The nineteenth-century poet John Clare is buried in the churchyard at Helpston, his native village between Stamford and Peterborough. 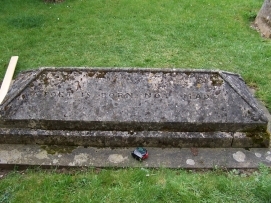 His tomb is pictured left above, and is heavily encrusted with lichen, which makes the Victorian lettering difficult to read and the tomb difficult to locate for its many visitors. 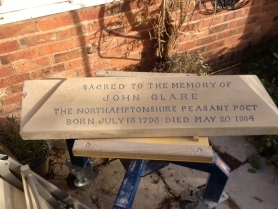 After some of my work was shown in the excellent Clare Cottage (his attractively-restored birthplace at Helpston) the John Clare Society contacted me for suggestions about creating a marker for the tomb for the 150th anniversary of his death, in 2014. 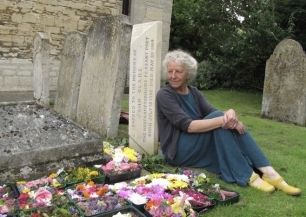 It would need both to locate it for visitors and re-present the wording, all in a way which was consistent with the mellow character and materials of the churchyard. I suggested a roughly half-scale reproduction of the tomb which would stand it on its end and carry the replicated wording down each side, in the original script. 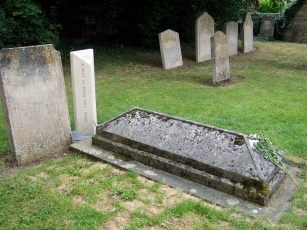 This brings it to the same height as adjacent tombs and the choice of Ancaster stone keeps it consistent in character. I took rubbings of the lettering and, beneath the lichen, found a most attractive rather curvy Victorian script which I have enjoyed replicating. He did not get this wish in his original tomb, but they are inscribed into the top surface of the new stone in a deliberatley contrasting font. 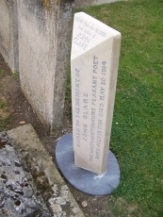 Clare has his wish 150 years later. 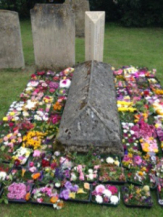 Each year the children of Helpston lay 'Midsummer Cushions' at Clare's tomb. 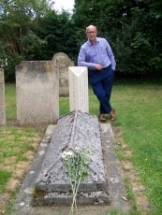 It is lovely to find images of them with the new grave-marker, like the one above left..
On the right is the President of the John Clare Society, Carry Ackroyd.